Is this a path to set up VLANs in my small office with a hp V1910 series ProCurve switch? ... and what am I missing? The network is /24, so all IPs are in the same 192.168.0.X subnet. The switch is a V1910-24G and is currently operational with the factory default configuration which is all ports untagged on VLAN001 and VLan1-interface is set on 192.168.0.5. The firewall / gateway / router / dhcp server is on 192.168.0.2 running pfsense. To get everyone access to the internet, I set up a static route from 0.0.0.0 of netmask 0.0.0.0 to the pfsense firewall on 192.168.0.2. The DHCP server has set every client's gateway to the switch on 192.168.0.5. ... unlocked the concept for me of what I was visualizing from the beginning: a simple way to contain workplace functions grouped by physical ports. I'll start attempting to implement this tomorrow after shipping has concluded (and we're done making $ from the internet). From the research I've done, mapping VLANs by port isn't preferred; however, there are only 5 of us here and I'm the only person mucking about with voodoo. Everyone else sits at their computer and just wants to get work done. 2) Enable QoS for the VoIP boxes. 3) The RAID server is a Debian 7.3 host and I could set up tagging and VLANs on this box and then change its port to a "trunk" if that would get a theoretical performance improvement. Everything but the VoIP and printers is Gigabit and the network is like in this post, only the Dell has been replaced by the hp ProCurve. 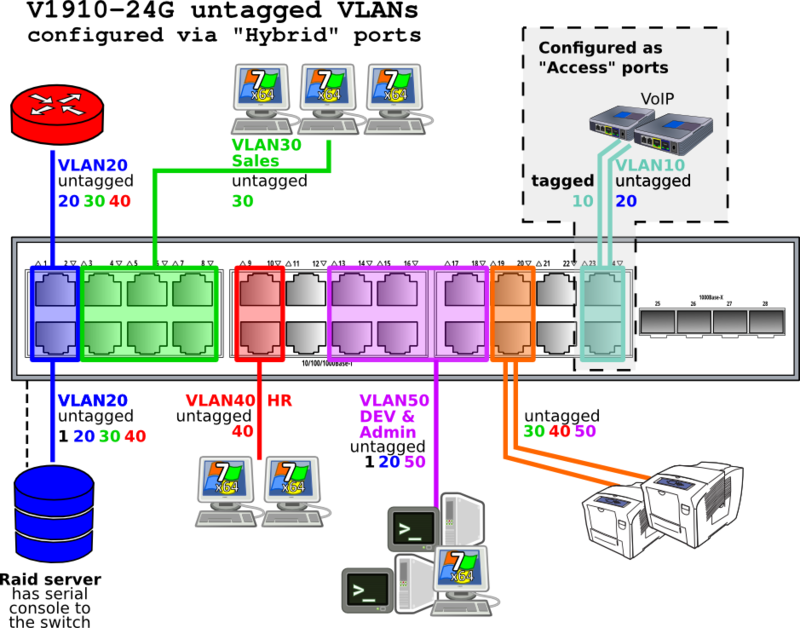 Browse other questions tagged networking switch vlan or ask your own question.